There can’t be many people out there who haven’t pondered, prevaricated and procrastinated over what to use as an avatar. If you’re on a social network, you’ve had to choose how to present yourself. If you’re on LInkedIn, you’ve probably played it quite straight. On Twitter, you might’ve displayed your slightly cheekier side. And on Facebook, anything could happen really, couldn’t it? Well, it certainly could now. 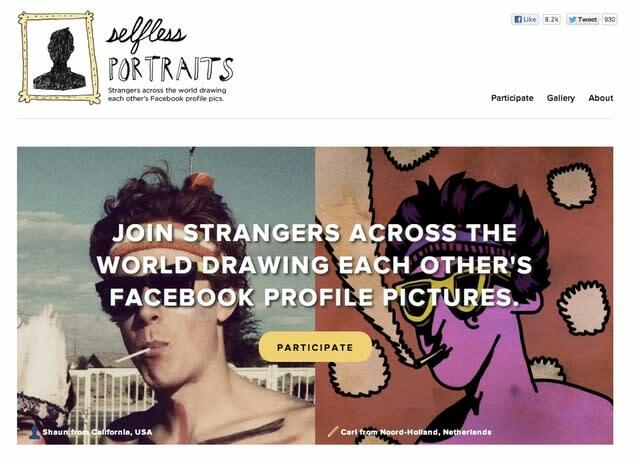 With selflessportraits.com you’re asking somebody else to provide you with a new profile picture. It’s a collaborative art project that’s spanning the globe. People from every continent are drawing each other’s avatars and sharing a thoroughly contemporary, remote, yet somehow intimate, experience. The results are eclectic and brilliant, and we’re struggling to think of a better way to show a little individuality online. If you want to take part, it’s quid pro quo: you won’t get your portrait back until you upload one you’ve done of somebody else.